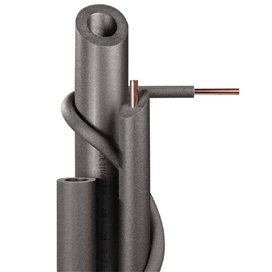 Our Pipe insulation range comprises new Climaflex BS 7523:1991 Type A - a flexible pipe insulation manufactured by extrusion of expanded polyethylene material. Features are: Polyethylene Pipe Insulation (Class P Pre Rating). Available in improved Thermal Conductivity (0.034 W/mK at 00C) Totally CFC & HCFC Free. Global Warming Potential (GWP) specified by “international panel on climate change” requires a reading of less than 5. Climaflex has a reading of Zero (0) Relevant sizes exceed Water Byelaw 49 requirements.